Today is secret recipe club reveal day! It happens every month and it's so much fun! 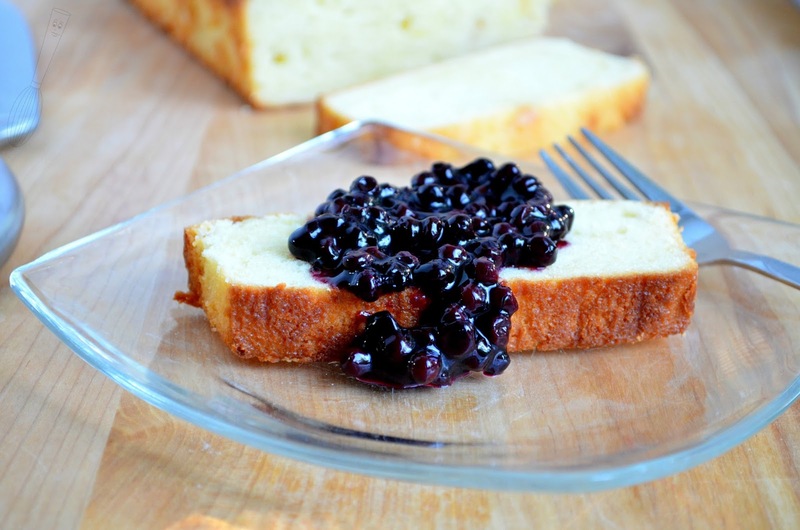 I chose to make a lemon pound cake with blueberry compote from the blog that I was assigned to. I don't make pound cake often but this recipe may change my mind. My previous attempts of pound cake came out as loaves of cake so dense they weren't good at all. This one is soft and fluffy while still having a dense feel to it. Perfect for topping with the blueberry compote or maybe just some fresh strawberries. For winter, maybe some baked cinnamon apples would be delicious too! If you've never heard of The Secret Recipe Club before, then you can find out more information by clicking here. The idea is that all of the members are assigned a blog (secretly of course!) and each member can peruse their assigned blog to find something that they would like to make, or several things to make in the future. The assigned blogs are kept completely secret until the reveal day and time, then you get to see who had your blog, and you get to post about what you made from your assigned blog. It's a lot of fun, and a great way to discover new blogs and recipes. This month I was assigned to Baking and Boys! I am so excited that I was assigned to Katrina's blog. I've been following her ever since I first discovered her blog through the Secret Recipe Club. She has four boys (not including her husband) to keep up with and that is amazing to me! I only have one son (and one daughter) and can hardly keep up with them. Her blog chronicles exciting times with her family and delicious recipes. I was all over her site trying to decide what to make. My top two were the Tuxedo Cake and the Lemon Sour Cream Pound Cake with Blueberry Compote. I still may make the Tuxedo Cake one day. There are so many delicious recipes that may be in my future, like the orange rolls filled with chocolate, raspberry streusel dessert bars, and peanut butter dream cheesecake cups! I look forward to trying all of those! 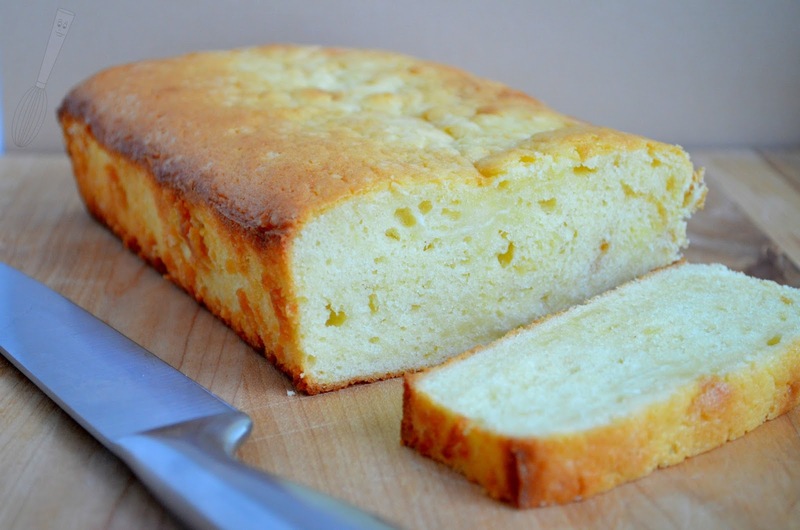 For now, I am in love with this pound cake recipe and can hardly wait to make it again! I followed the pound cake recipe exactly, but only made a half batch (the half recipe is below) of the blueberry compote. I used Trader Joe's frozen wild Maine blueberries and they worked perfectly. The wild Maine blueberries are smaller than traditional blueberries and they worked so well in this recipe. I hope you love this as much as I did! 1. Preheat oven to 325 degrees F. Spray a 9”x5” pan with non-stick spray. 2. In a medium bowl, whisk together the flour, baking soda and salt then set aside. 3. Using a mixer, beat the butter until fluffy then add the sugar ¼ cup at a time and beat for 5 minutes. Add the eggs one at a time until each is combined, scraping between additions. Beat in lemon juice and zest. Stir the dry ingredients into the wet ingredients. 4. Add the sour cream and fold it into the batter until blended with no streaks. Spread the batter evenly in the pan. 5. Bake for about 50-55 minutes or until a toothpick inserted in the center comes out clean. Let the cake cool in the pan on a wire rack for 15 minutes. Run a butter knife around the edges of the pan to release the cake and remove it. Cool it completely on a wire rack. 6. Combine the blueberries with the sugar and lemon juice and let sit for 30 minutes. Pour the the berries and any liquid into a saucepan. Dissolve the cornstarch in a small amount of water (about 2-3 teaspoons) and add to the berries with the zest. Bring to a boil, while stirring gently. Let the mixture boil until the juices are clear and very thick—about 30 to 60 seconds. Empty into a bowl and cool to room temperature without stirring. Chill. Makes a generous 2 cups. 7. 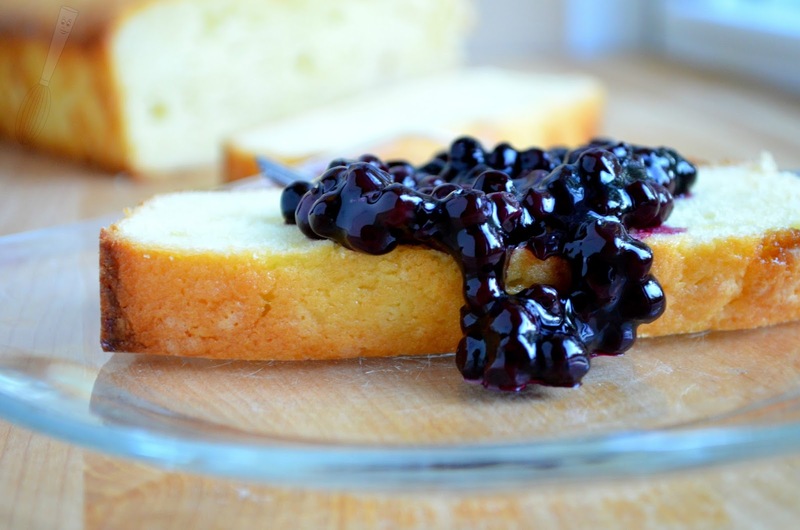 Serve the pound cake sprinkled with powdered sugar (if desired), and topped with blueberry compote. Recipe adapted from Baking and Boys!